Marlene MacCallum: " My photogravure prints and book works explore variations of three ongoing preoccupations: instances of perceptual paradox, illusionism and illumination. I use the camera to record within and about domestic architecture. From this imagery source I create prints that echo the sensory and temporal paradoxes we may experience during the perception of the quotidian. Illusionism underscores the uncanny response as we view an image that is persuasive in its spatial representation while maintaining the graphic material flatness of paper and ink. External light filters our perception of interior spaces and reiterates the architectural and perceptual threshold. 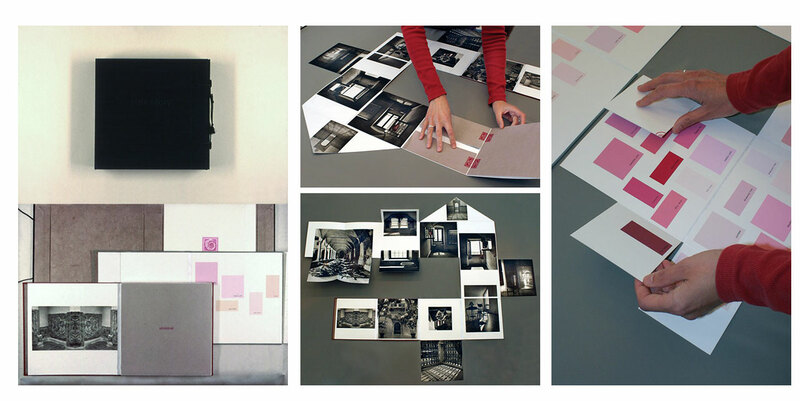 My artist’s books emphasize visual narrative and the effect of image memory in constructing sequences." Corner Brook, Newfoundland, Canada: Marlene MacCallum, 2016. Edition of 20. 7.625 x 5.125"; 21 pages. Accordion structure. Handbound with folded paper cover and wrapper. Images printed in photogravure and lithography. Text printed in letterpress. In paper slipcase with slip and slot closure. Signed by both MacCallum and Hollett and numbered on the case and the colophon. Marlene MacCallum: "Tea Ceremonies is a collaboration with Newfoundland artist and writer, Matthew Hollett. The piece began with Matthew's text and I then created an image response and designed the book layout and structure. This work celebrates everyday rituals and small ceremonies. The piece explores repetition and sequence in its use of layered text paralleling the way everyday activities leave residue. 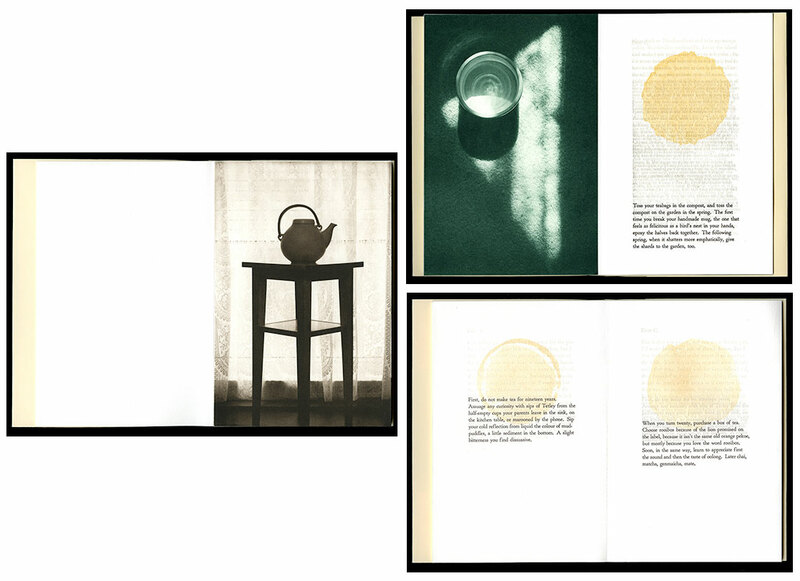 Text, photogravure images, and lithographic tea stains interact in counterpoint throughout the sequence of the book." Corner Brook, Newfoundland, Canada: Marlene MacCallum, 2013. Edition of 14. 10.25 x 5.125"; 30 pages. Accordion structure. Fifteen photogravure plates handprinted on Somerset paper. Closed into a codex form by sewing across the spine into the end pages. Soft pocket-structure cover inkjet printed on coated tyvek. Slipcased. Signed and numbered by the artist. 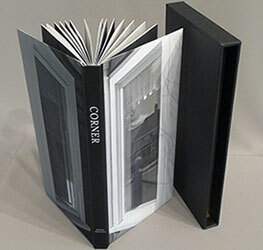 Marlene MacCallum: "Corner is the final bookwork in a series inspired by living in Corner Brook's Townsite area on the west coast of Newfoundland. Between 1924-34 the pulp mill built 150 homes to house the mill management and skilled laborers. I have photographed in several Townsite homes, all the same type-4 model as the one I live in, allowing me the rare opportunity to record the evolution of interior aspects of these homes. "The experience of Corner begins with the brick shaped slipcase containing the book. Slipping the book out, it rests comfortably within the hand. The images on the cover position the viewer outside the home. Turning to the end pages, the viewer moves inside the personal space. The first spaces are entryways and then the viewer is led deeper into the home; from sparsely furnished entrances the images gradually move us into the more densely filled and layered living spaces. The perspective within each echoes the perspective of the book pages. The gutter coincides with the represented corner, creating interplay between the architecture of the book and of the imagery. Each page spread cradles an unoccupied space charged with implied conversations between absent inhabitants." Corner Brook, NL, Canada: Marlene MacCallum, 2012. Edition of 100. 8.25 x 8.25 x 8.25; 56 pages. Handsewn quarter bound codex in a dos-à-dos structure with a wrapper. Digital inkjet printing. Illustrated covers and wrapper on coated tyvek. Signed and numbered. Marlene MacCallum: "Glaze: Reveal and Veiled is one of a series of book works inspired by the experience of living in Corner Brook's Townsite area on the west coast of the island of Newfoundland. 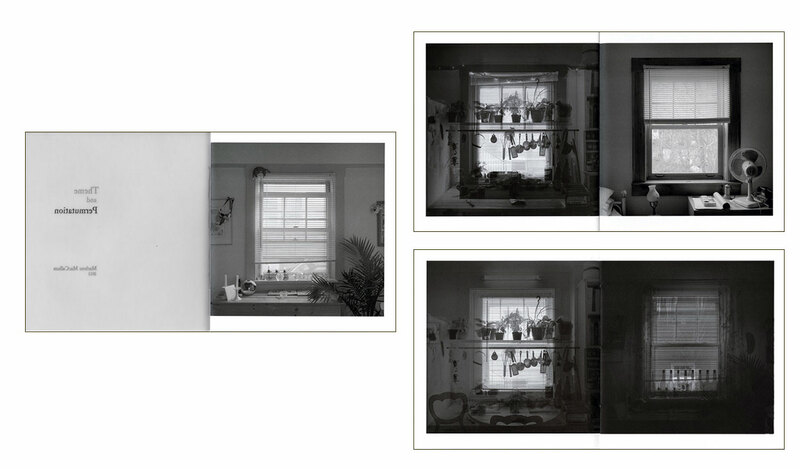 It presents 24 images of Townsite windows grouped into two distinct sequences. The structure is a dos a dos and each side offers a different visual metaphor for memory. The closed book is contained within a wrapper and the viewer has the option of choosing which side to enter first. Each begins similarly with endpapers made from scans of window curtains followed by line drawings of the window frames as the graphic for the title pages. 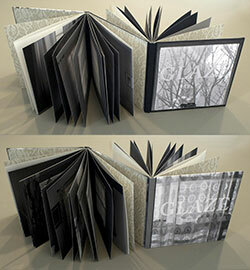 Moving into Glaze: Reveal, the viewer is presented with a spread consisting of a blank white space on the verso and dense black on the recto. Turning the page, the next spread presents an image of a window on the verso and a dense black field on the recto with a glimmer of light appearing. As the viewer continues to move through the pages, each spread reveals a new window image that has been visually peeled away from the densely layered recto. The layering slowly becomes visible revealing the final presentation of single images. In contrast, moving into Glaze: Veiled the viewer begins with window image that is layered with the previous title page line drawing. In the next spread, the same window is presented alone on the verso. The recto side layers the previous images as well as introducing the upcoming image. The viewer experiences a visual deja vu each time the pages turn. The progress through the work results in ever more layered and veiled images. 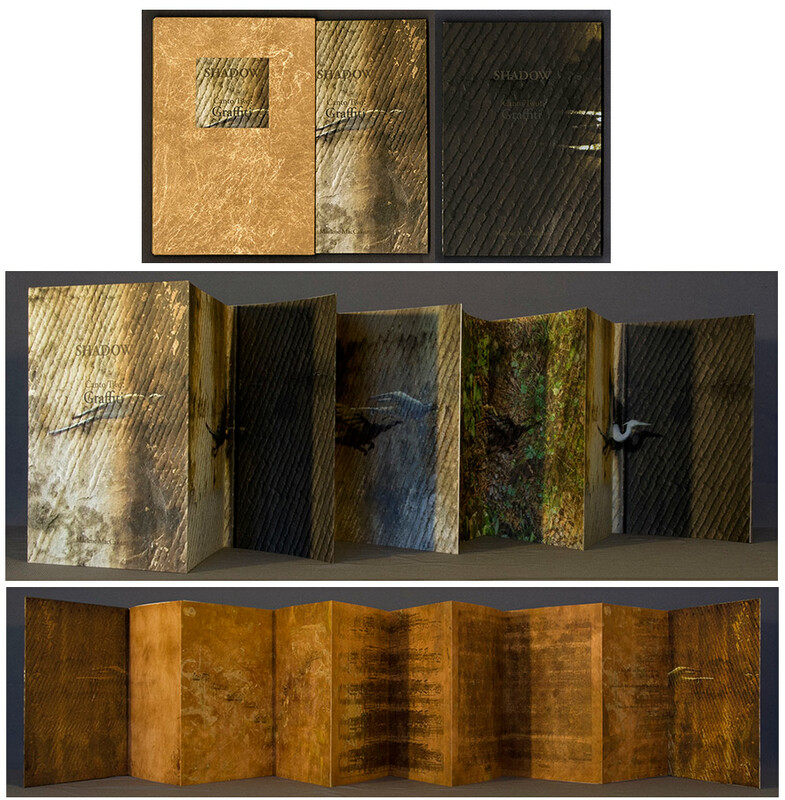 This work received special recognition of merit at the 2013 Minnesota Center for Book Arts Book Prize." Corner Brook, Newfoundland, Canada: Marlene MacCallum, 2012. Edition of 100. 9.25 x 8.5"; 28 pages. Hand sewn pamphlet. Images printed in offset lithography on Mohawk Superfine. Text printed in inkjet. Translucent covers with inkjet printed on Glama. Signed and numbered by the artist. 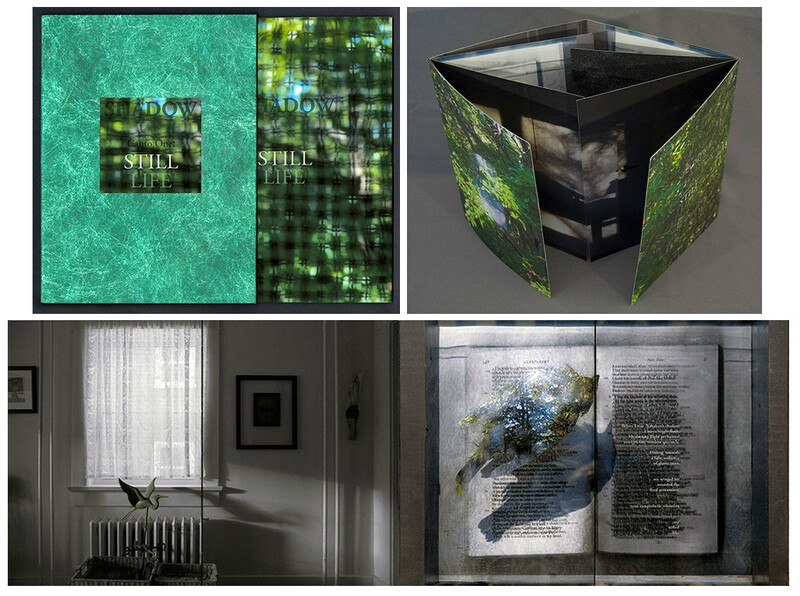 Marlene MacCallum: "Theme and Permutation is one of a series of artist’s books inspired by the experience of living in Corner Brook’s Townsite area on the west coast of the island of Newfoundland. It is s a response to the permutations and variations of the type-4 Townsite House. Digital tools were used to translate the original film source of eight different window images from five houses. The sixteen offset lithographic plates were custom printed in twenty-nine separate press runs. Each image is the result of a different combination of plates. 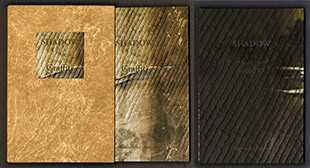 The structure is a sewn pamphlet with translucent covers. 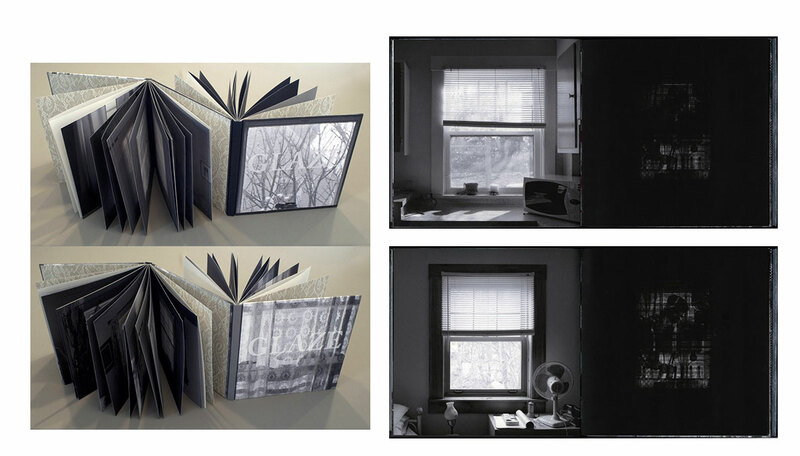 The viewer enters the body of the book with a tritone image of a single Townsite window. As one moves into the piece, new window images appear and layer over each other. The images become darker and more heavily layered towards the mid-point. The center spread has an inkjet layer of two text blocks printed over the offset litho images. The text speaks of the history of the homes, the architectural permutations and economic shifts within the Townsite area. The ensuing pages continue to provide new combinations of window layers, gradually lightening in tonality and allowing the individual windows to become more distinct. A third text block provides a personal narrative. 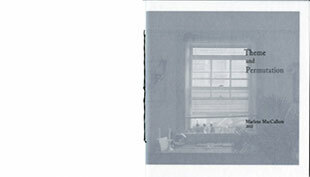 The piece concludes with a tritone image of one of the Townsite windows in original condition." Corner Brook, NL, Canada: Persnickety Press, 2006. Edition of 15. 10 x 10"; pages. Embossed leather covers. Fourteen photogravure images and three lith film images. Text and house plan screenprinted. Front flyleaf lace paper pasted to Moriki Title paper and house plan screenprinted on double matt mylar. Signed and numbered by the artist. Marlene MacCallum: "Townsite House was inspired by the experience of living in Corner Brook, NL's Townsite area. Four different models of homes were built in the 1920-30's by the pulp and paper mill for their management and skilled labor. I photographed in five homes, all the same model as the one I live in. 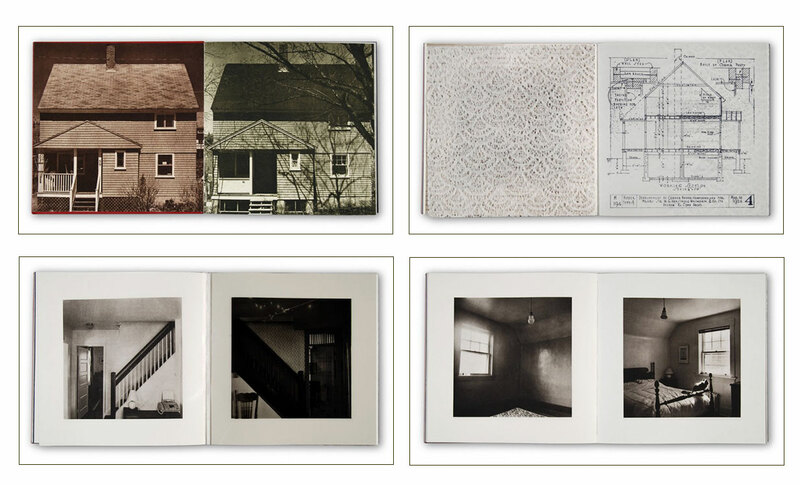 The book work sets out to provide the viewer with a visual equivalence of the uncanny experience of being in homes that are the same yet not the same as mine." Marlene MacCallum: "By using photogravure, the images function simultaneously as a document, or a photographic record, and a constructed memory, the printed artifact. This creates the dynamic of disjunction that is key to this piece." Corner Brook, Newfoundland, Canada: Persnickety Press, 2004-2005. Edition of 25. 8.25 x 8.5 x 2" x 2" closed. Dextral expands to 24.5 x 40.5". Sinstral expands to 39 x 48". Hand bound fold-out books in a wrapper case with button close. Dextral printed with a combination of screen printing and letterpress. Sinstral uses a combination of photogravure and letterpress. Verso paper hand-dyed. Colophon pastedown on cloth bound wrapper case. Signed and numbered by the artists. Marlene MacCallum: "This two-volume work brings together two seemingly contradictory representations of a woman's life. pink story: dextral is an artificially constructed narrative of a stereotypical woman's life. Paint chips offer the promise of covering flaws and the paint surface creates a facade. In contrast to this external perspective, pink story: sinstral presents an internalized story; constructed of photographs that represent spaces metaphoric of key stages in a woman's life. The two volumes are like mirror images reflecting each other offering a paradoxical reality to the viewer." orner Brook, Newfoundland, Canada: Marlene MacCallum, 2018. Edition of 15. 9.1875 x 12.25" closed, extends to 9.1875 x 61"; 8 pages. Double-sided accordion. Inkjet printed on aya and niyodo. Accordion binding with hard covers. In slipcase of stained tyvek. Signed, dated, and numbered by the artist. Marlene MacCallum: "Canto Two: Graffiti began with the discovery of a serial graffiti piece in an underpass in Rochester, NY. I was fascinated by the representation of a creature in flight locked into a static wall. 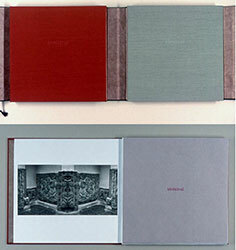 Using these photographs as a starting point, one side of the book is a series of layered images. Overlays of the graffiti images were elaborated upon by the inclusion of a desiccated bird corpse. The final spread re-introduces the heron from the previous canto as a cut-out pinned over the graffiti image. This creates a trompe l’oeil effect and also frees the bird from the wall. The accordion structure allows two readings. The spreads can be experienced as individual images, or the piece can be expanded and create a pseudo animation. The paper support becomes the architectural element, acting as the wall. While layering the images of the graffiti and actual birds, I was struck by the counterpoint of the images. This introduced a musical component to the piece. I studied piano and still play but am unable to perform due to paralyzing stage fright. In response to the interplay of images, I selected three piano pieces where the musical voices interact in a way that felt relevant. I scanned the musical notation and then reworked each piece into a single representation reflective of the piece. These images were then printed out and transferred onto copper, creating a visual record or performance. In this way, a form that is normally extended over time was collapsed into a singular presentation. Each side of Graffiti is a visual record of a fleeting instant; birds fly by, musical notes fade into space." Corner Brook, Newfoundland, Canada: Marlene MacCallum, 2018. Edition of 15. 9.25 x 6.75" closed, extends to 9.25 x 27". Inkjet printed on aya. 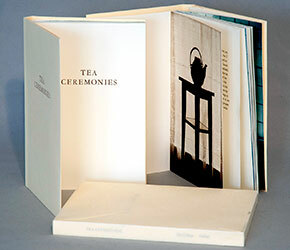 Pamphlet binding with gatefold structure. Hand bound. In slipcase of stained Tyvek. Signed and dated by the artist. Marlene MacCallum: "The first canto, Still Life, began when a cedar waxwing flew into a picture window and died. Avian fatalities are far too common because of the excessive size of our picture windows. 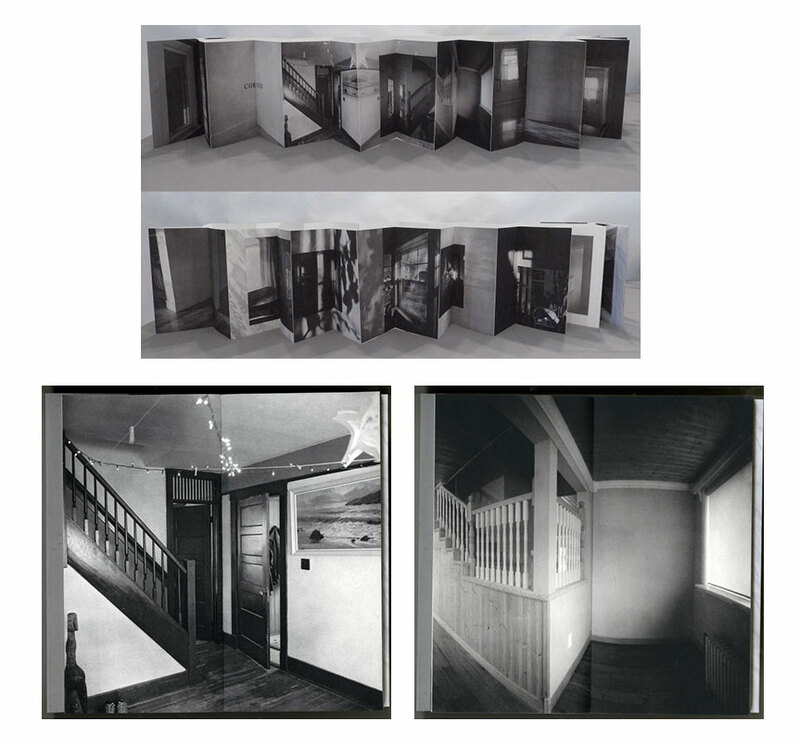 The emotional experience triggered a memory of the first canto from Vladimir Nabokov’s Pale Fire, “I was the shadow of the waxwing slain by the false azure in the windowpane…” and then proceeds to create imagery of the viewer seeing reflections and doublings of the interior and exterior spaces. Building on this literary source, my visual recording of the incident evolved into both an elegy and a musing on the nature of stilled lives. 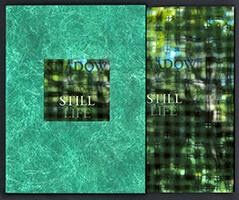 The cover of Still Life is a close-up view of a window screen and distant blurred trees. The title page brings the trees into focus and reveals a reflected window hovering within the branches. The next pair of images turns the viewer inwards to face the projection of the window light and trees shadows playing on the wall. The following spreads pair still life images. The waxwing is suspended above a layered version of Canto One from Pale Fire and is juxtaposed with a fallen weathervane in the form of a heron. The final spread presents, on the left, the same weathervane poised for flight within an interior space and, on the right, the image of the waxwing has been liberated and replaced with the view through the window. The brief text is written from the bird’s perspective. The sequence of images plays with formal and spatial qualities and the gatefold structure allows the viewer to create their own pairings. The experience of the piece is that of moving through the interior structure of the book while contemplating images of interiority and the nature of the 'still life' and the stilled life. Making this work is part of my process of reconciling the reality that my home is my shelter but has negative impact on the surrounding wildlife."